Inaccurate. Democrats can't undo jack unless they take the House _and_ the Senate. The House can pass articles of impeachment against Trump and Kavanaugh with a simple majority, but actually removing them from office requires 67 votes in the Senate, where Dems are about to drop from 49 seats to 44. The best Democrats can do now is retake the house by a razor-thin margin and obstruct Trump's legislative agenda, which Congress has been doing anyway. In that case, the GE uses impeachment to troll his way to a Trumpslide in 2020, and he takes the House with him. The advantage we have is that the DNC, the D congressmen, and their NPCs are already whipping up the crazies and freaks. May they storm the streets of the US, waking the Normies until November 7. -Republican party affiliation topping the Democrats for the first time in living memory. The crazies are turning the Dems' defeat into a rout. Now comes the perpwalks, and with it the destruction of the Dem machine from coast to coast. Nominating Roy Moore would be awesome. Besides said nomination being the best way to give it to the Dems, what would they be left with as far as tactics are concerned? They can’t trot out those skanks again who all slandered him and then went into the shadows. They can’t do new ones because the former throng of liars never went anywhere with their accusations. So they’d have to what, get some Soy Latte NPC to come out and say Moore was mean to them in the 4th grade by refusing to pass the ball to them during recess?! Sen Graham, you have the floor. The dumbest thing the Dems have done is make it fun to make fun of them. "GTFO" will be the only response the ten-seat Republican majority has to give. Will Kavanagh really go after Blassey Ford? Will some more senators face censure and more congressional staff be arrested? I doubt it. Lindsey Graham's redpill moment articulated what regular Americans concluded from the unhinged theatre. All regulars finally get it and will severely castigate the Dems for the evil obsession for power and nothing but. Nah, the Dems torpedoed their own chances for winning control of either house with this debacle. We now have a 45-seat majority in the House. To take control, Democrats must flip 23 seats. Incumbents win 85% of the time. To overcome that hurdle, the Democrat base not only has to be fired up, but significantly more fired up than ours. That ship has sailed since polls now show voter enthusiasm in a a dead heat, and with perennial Dem oversampling, I suspect we actually have the edge. Remember that BLM's 2016 antics didn't show up in the polls but swung normies for Trump. The Kavanaugh affair is analogous, but it's visibly moving the needle. Individual Dem candidates are tanking, and their national generic ballot lead plunged from 11 to 6. History shows that the opposition party doesn't retake Congress under these conditions without a 15 point lead. Farther out, a tsunami only looks like a ripple. Elections in the US always used to break down like this: There were more Dems, but they had lousy voter turnout compared to Republicans. Now, for the first time, more Americans self-identify as Republicans than as Democrats. And that was before Justice K.
The math just doesn't work out for the Democrats. The Kavanaugh witch hunt was chum in the water for the unhinged cat lady crowd, but it repulsed normie Dems. Expect even more working class white men to abandon the Democrat party now that their leadership is vowing to impeach Judge Dredd. Unless something big changes, to riff on Jeff Flake, the House stays the same and Republicans raise their Senate majority to +5. And to add to what Brian said, Harrison, if the Left is so fired up, why was the turnout for the Kavanaugh protest so poor? These losers have nothing to do other than “resist”. Yesterday we got some lesbo cat lady on a statue screaming to an audience of 20 blue-dyed, soy-swilling, weed-scented NPCs. They are rapidly becoming the party of intersectional rheeee-dom. 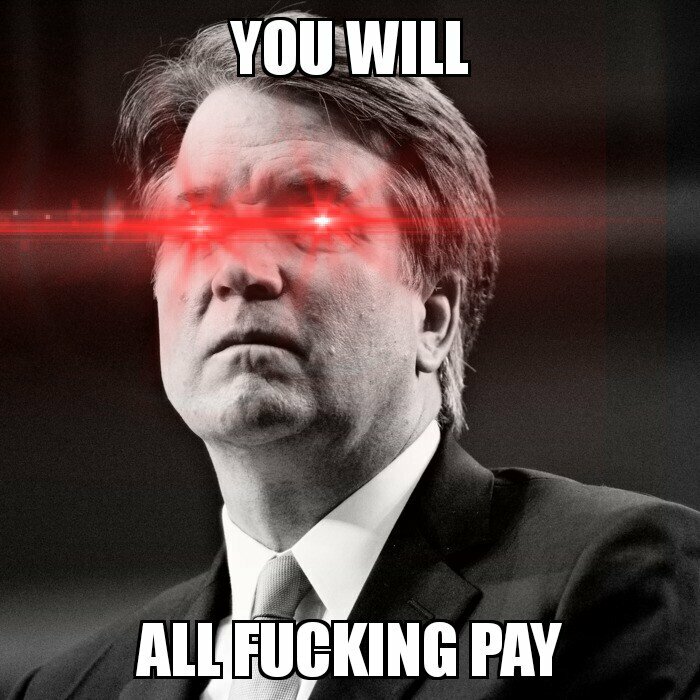 Just once, just ONCE I wanna hear Justice Kavanaugh (man that feels good to say) to growl out "I am the law"
I'm personally rooting for Bill Pryor, but Roy More would be a nice "screw you" to the appropriate crowed. I will say that right now that Amy Barrett is the worst possible choice from what I can see, all the wrong people back her. As for the party finally backing Trump? I'm still cynical, we will see. Sure it's great seeing Lindsey Graham finally having testicular fortitude, but will it last to issues that matter? It didn't take long until the unity around Gorsuch turned into 'b-b-b-but Gorsuch' mockery. The real test will be immigration. Will they stop playing games with the wall and finally back Trumps hugely popular immigration measures? Time will tell. The strategy of primarying cucks and replacing them with populists seemed to have failed during the Moore push, but I guess time will tell. I am hoping the senate gets those +5 seats, but they've had a majority since 201, yet have done Jack Crap with it, despite Trump's urging. Trump has had to get stuff done with the Pen-Phone route, which is pretty temporary. This isn't 2014, or even 2016. Trump has been pretty good at getting Congress to vote his way. Even Flake has voted with him consistently. That's why the federal courts are being packed with conservative judges. Where Trump has run into trouble up till now is with cucks like McCain and Ryan keeping his legislation from coming to a vote. Ryan will be gone next year. McCain is already gone, and it's probably no coincidence that Graham turned over a new leaf right after Senator Songbird died. An explanation for congressional Republicans' resistance to Trump's agenda which fits the facts is that they really thought a) the Democrats were honest but misguided rivals and b) the sexual misconduct/muh Russia allegations against Trump were true. A) had been steadily eroding, and the Kavanaugh business was the final nail in the coffin. Pelosi just let slip that b) was ginned up to cover her party's cynical power grab. McCain and Ryan's gambit was to assume the GE's win was due to cheating or a fluke, ride it out, and get back to business as usual in 2021. The Dems' freakout over Kavanaugh, especially their flagrant lies, finally redpilled the GOPe. Thank Feinstein. It was her caving to the cat ladies and shredding the old gentlemen's agreement that unleashed Cocaine Mitch and Based Lindsey and disgusted Collins enough to make a 45-minute speech flaying the Democrats. That's not just political opportunism. These people are pissed. If you want to get cynical, remember that these guys like being Senators and want to keep their jobs. The polls leave no doubt that backing Trump's guy--and therefore Trump--is mandatory if Republicans want to win. If you want to get really cynical, somebody new is holding Graham's leash, and it looks like that someone is Trump. Graham tweeted "Not tired of winning!" yesterday, FFS. As for primarying the cucks failing, don't let the few high-profile failures fool you. Nehlen went full retard, and Moore was backstabbed by the RNC. Don't fixate on those two guys. Look at how the Left is freaking out over this year's Republican field, which is decidedly Trumpian. When McConnell said we'd discuss the Wall after the midterms, most folks' knee-jerk reaction was to assume cucking on his part. I think the loyalty he showed Trump and Kavanaugh merits giving him a little slack. The confirmation delays that everybody decried as cucking turned out to be a master strategy that won the day. If this tawdry episode taught us anything, it's that you don't press for a vote unless you know you're going to win. Mitch knows he'll have a more Trumpist Congress next year, probably with Jim Jordan as Speaker. That's a perfect recipe for a Wall. Deus Vult indeed. God grant we make them pay and break their power soon, because the next fight will be even dirtier. The masks are off.